Hafsa works in recruitment support for Her Majesty's Courts and Tribunals Service in Birmingham, part of the Ministry of Justice (MoJ). 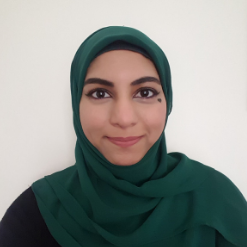 Hafsa is very active in the Midlands subgroup of the department’s LGBT network, Spirit. This includes helping to organise an event for Bi Visibility Day in the region and speaking on the panel, and arranging the MoJ presence at Birmingham Pride. Hafsa is also an ally of a:gender, the cross Civil Service trans network. In September, Hafsa featured in a department-wide campaign promoting its values and how she exemplifies the value of ‘humanity’. Following this she shared the stage alongside senior leaders to speak about diversity and inclusion and her experiences as a BAME, LGBT Muslim woman as well as someone who has a disability.